We recommend starting the walk through the original nucleus of the city: Sota-ribes, on the other side of the Ribes stream, formed around the old castle of Ribes (or Bell-lloc), already documented in 990. It is a fortification that defended the passage between the mountain and the sea in the times of the Marca, the always sensitive and changing border between the Islamic domains and the Christian domains. The highlight of the castle is its cylindrical tower. It is currently inhabited, but the Tourist Office organizes arranged visits on certain days of the month. Next to the castle is the old church of Sant Pere, with three naves, with rounded external buttresses of support and a bell tower with a square base and openings with a semicircular arch. Its origin dates back to the 10th century, with a small pre-Romanesque church. The current building was agreed in 1663, after the War of the Reapers. 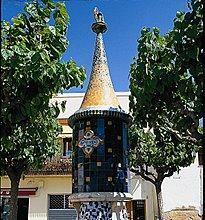 It was built in twelve years at the expense of the resources of the town and its use was parochial until 1910. It is worth noting the so-called Portal de les Ànimes, from the fourteenth century, from the old temple. The whole, between crags and sporadic pines, is completed by the Casa del Terme (15th century), former seat of the town hall and now the tourism office, and the Palanca bridge, with the centennial pine declared a monumental tree. It is advisable to continue the itinerary along the Calle Major until the intersection with Calle del Doctor Marañón, where the Redós de Sant Josep i Sant Pere is located, a modernist building built in 1901 with “American” money and serving as a hospital and asylum . It occupies a whole block of houses and highlights its cloister, the chapel, the crenellated tower and the garden. The itinerary is taken along Major Street to Plaza de la Font, where the modernist fountain commemorates the arrival of canalized water in 1906. Nearby, the Plaza de la Vila, with two emblematic buildings: Casa de la Vila, of eclectic character and that has undergone several renovations -the most radical being that of 1893-, and can Quima, modernist building of multi-family dwellings of the early twentieth century. Once here, you can continue along the street of Mossèn Andreu Malgà to reach the Hermitage of Sant Pau, next to an old Roman villa. On the way back to the Plaza de la Vila, it is recommended to continue along Calle del Pi, where the centenary tree that gives its name to the street and various American houses, such as can Maurici (No. 16), can Milà de Palou ( No. 52) or can Giralt, at the end of the street. 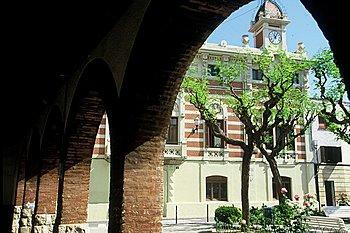 Nearby, in the Palou neighborhood, we can see the lavish farmhouses of the Casa Gran, the Granja and can Pau Artigas. Back to the center, through the Plaza de la Vila and the Comerç street, you reach the Marcer square, the nerve center of Ribes, and a few meters away is the square where the parish church of Sant Pere, inaugurated in 1910, is located. neo-gothic style, with two lofty twin towers. To finish it is very advisable to take the car to see Mas Solers and its grove (leaving Sota-ribes by the BV-2112). It is a residential building of classicist style of Noucentisme character, built in 1918 by the Marquis and engineer Eduard Maristany. First he installed some warehouses and the current mansion, which was remodeled in 1979 to house, until a few years ago, the Gran Casino de Barcelona. Today it has been converted into a space for all kinds of celebrations.